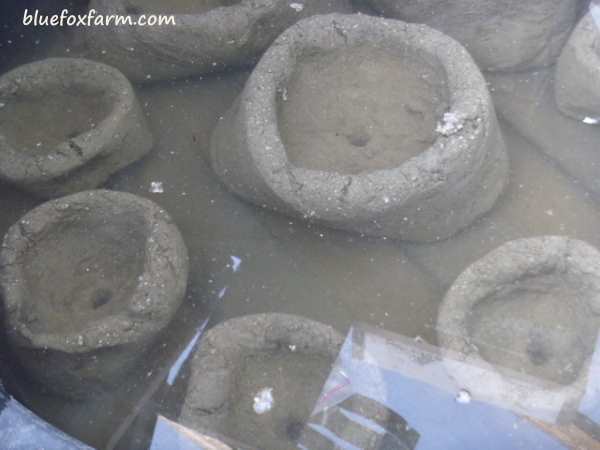 I spent about an hour making hypertufa pinch pots, just to see how doable it was. I had so much fun with this rustic garden craft, I went back and did some more! 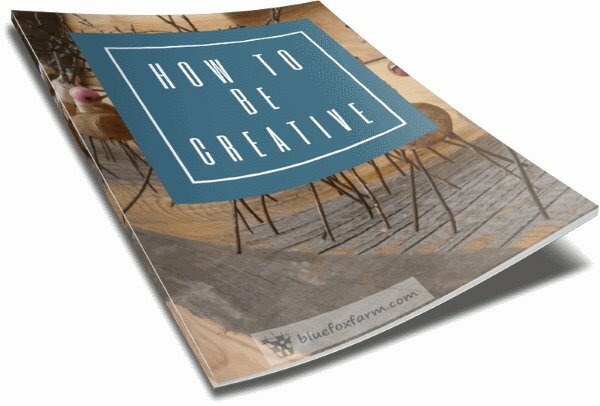 Don’t be intimidated by the thought of this project – if you just make up a small amount of the mix, it’s easy to make eight or so of these fun and unique planters, without it becoming a chore. Save up your Ziploc bags, rinse them out first, and when you have eight or ten saved up, it’s time to make some hypertufa. 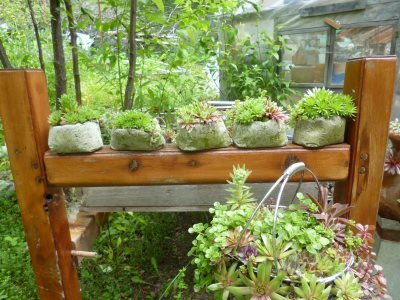 The sandwich size is perfect for little gem-like displays of your favorite hardy succulents, moss or other alpine plants. The slightly larger sized bags will make a little group planting for several different kinds planted together - texture is the key here. Make sure you put a drainage hole in the bottom; they only hold a few teaspoons of soil, but you don’t want it waterlogged. 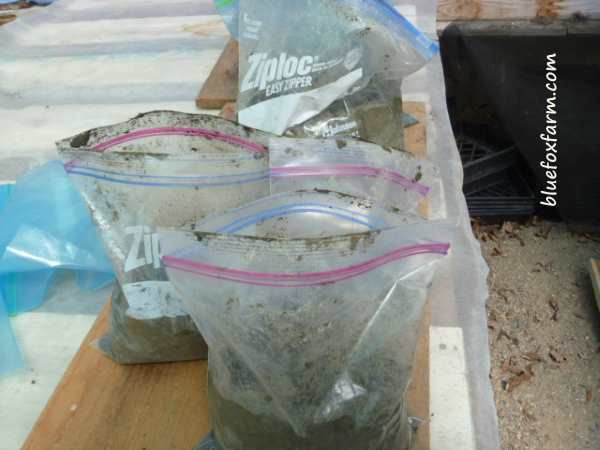 Make the hypertufa mix; I use a 1:1:1:1 mixture of sifted peat moss: builder’s sand or sandblasting slag: Portland cement powder: and perlite. There are many other recipes out there, but this one seems to work fine without any fiddling about. I made a scoop out of a detergent container to use as a measure for one part of each ingredient. 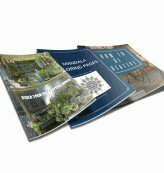 Before you start, see the instructions on the Hypertufa How To and How to Make Hypertufa pages. Once your mixture is ready, with the water added and thoroughly mixed up, put a couple of handfuls into each bag. Pack the mix up the sides, making a depression in the middle. Aim for equal thickness all around, and then poke your finger into the middle of the bottom of it to make a drainage hole. Push the sides of the bag down into the center, and cover with cardboard, Styrofoam or other material to shade it and keep from freezing. The next day, you can remove the bags; usually you won’t be able to retrieve them; sadly, they’re a single use item. Clean off any excess hypertufa, such as the bits that go into the corners of the bag; brush carefully with a wire brush if you wish, and clean out the drain holes with a drill bit, large nail or stick. 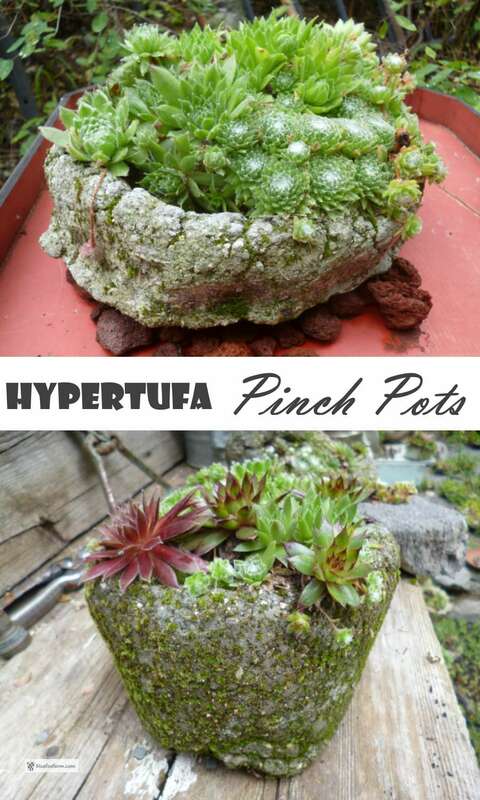 Completely immerse the hypertufa pinch pots in a bucket of water. They should stay in the water, which you can change periodically, for at least one to four weeks. By that time they’ll be fully cured, and stable, ready to plant. Omit the curing step at your own risk, as the concrete won’t be very strong and the pots will be brittle or crumbly. 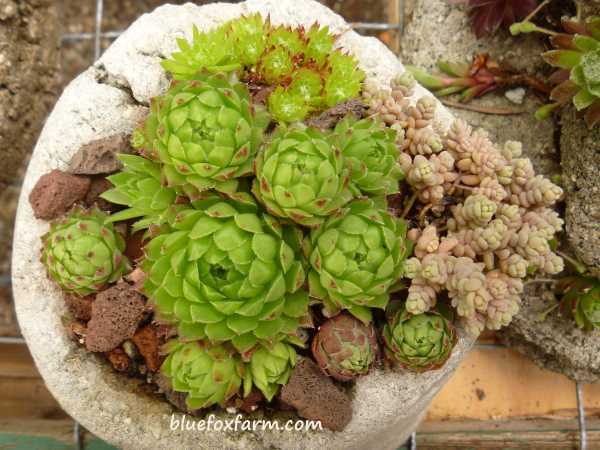 Once the long wait is over, plant up some Sempervivum, Jovibarba and Sedum into your special little hypertufa pinch pots and display them on staging, steps or right in the garden on mulched beds or the top of a rock wall. With their rustic and weathered appearance, they’ll blend right in. 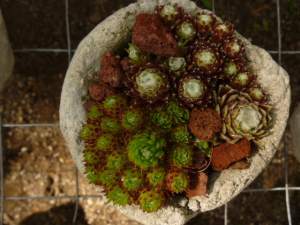 See the page on How to Make Hypertufa Look Old for some ideas on weathering your pots. 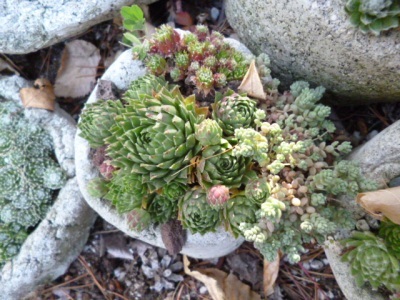 For some other tiny hypertufa pots look here: Hypertufa Hands.